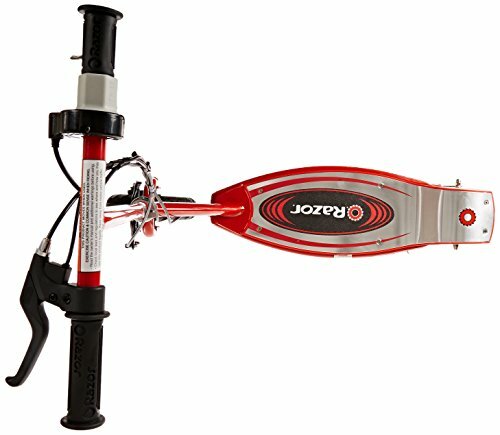 This nifty little scooter will be a favorite toy of your child from day one. Known and loved by millions, Razor has become synonymous with scooters. In business for over a decade, this company is known worldwide. They stand behind their products and offer excellent customer service. Razor produces several models of the E series scooter. Today, we are going to take an in-depth look at their E-100 Model scooter. The Razor E-100 uses a chain driven, high torque motor to power the electric scooter. In order for the motr to engage, the scooter must be traveling at 3 mph or more. For that reason, it is necessary to push start the scooter while twisting the throttle control hand grip. 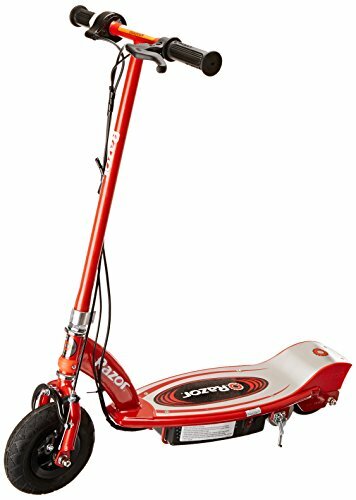 This could be challenging for young children.Once the speed reaches 3 mph, the motor will automatically start and the scooter operates as a self propelled vehicle. According to the manufacturer, the maximum travel speed for the E-100 is 10 mph. This speed is attainable on flat, smooth surfaces. 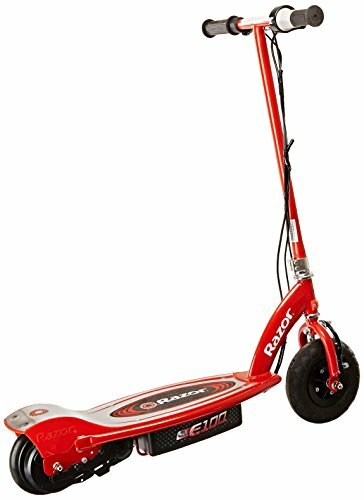 The scooter will travel up slight inclines, but expect some battery power loss. The company recommends that the unit be operated on level surfaces. The Razor E-100 will run for about 40 minutes before the battery needs to be charged. Recharging is slow though. It takes a minimum of 12 hours to recharge, and the owner’s manual recommends a complete 24 hour recharging cycle for maximum battery life. Recharging is as simple as attaching a cable to the charging port on the underside of the scooter, then plug the unit into any wall outlet. The E-100 has a powder coated, enameled steel frame and fork, available in your choice of three colors: pink, red, or purple. The front fork holds a 8 inch pneumatic rubber tire with knobby tread. The rear wheel is made of polyurethane and is mounted below the safety guard for the chain that powers the scooter. The throttle control is located on the right hand grip and uses a twist motion to increase or decrease the speed of the scooter. A cable operated hand brake is located on the left hand grip. In order to stop the scooter it is necessary to completely release any pressure on the throttle, allow the unit to coast, then apply the brake. The brake can be adjusted for quicker or slower stopping. Other features of the E-100 include a wide, sturdy deck with plenty of foot space on a non slip pad. A retractable kick stand holds the scooter upright when not in use, and protects the motor, chain, and battery compartment from damage. 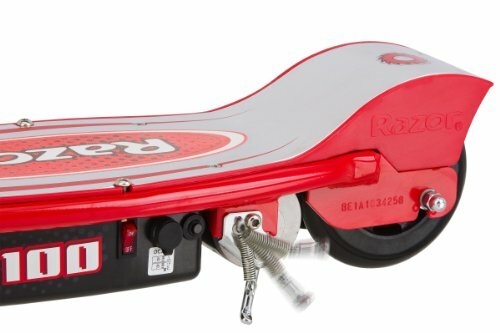 The Razor scooter ships from the U.S. in a printed box and does require assembly. 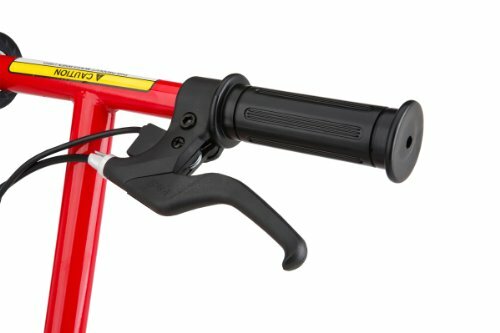 The handlebar assembly must be attached to the base unit, and will require some tools to complete this task. The front tire must also be inflated after the unit is assembled. Before the motor will engage, the scooter must be traveling at 3 mph. This might be difficult for a child. Another weakness is the slick, polyurethane rear wheel. It allows the scooter to easily become out of control if you run onto a rough spot. The battery charge time is slow, and most kids are not going to want to wait that long before they can play with their new toy. It requires assembly before you can use it. 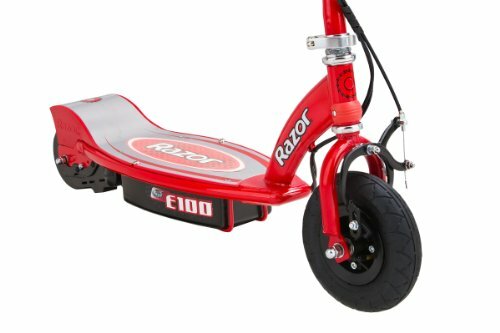 The Razor E-100 is a high quality child's toy made by a reputable company with many years of experience. It will carry a child up to 100 pounds at 10 mph. The battery life is about 40 minutes, but the recharging time is a minimum of 12 hours. The unit operates by a high torque, chain driven motor attached to a wheel hub. The front wheel is air filled with tread, but the back wheel is slick plastic like material. 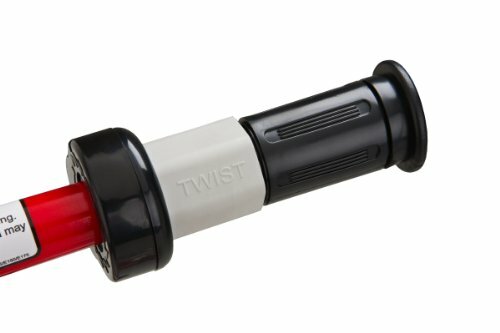 Speed is controlled by a twist grip throttle. There is a cable operated hand brake to help slow the scooter. It does require some assembly and an initial 24 hour battery charge before it can be used.